By Jose "joeyj" Jereos Jr. 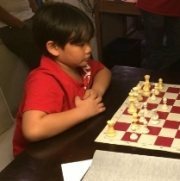 The Philippines youngest FIDE Master (FM) Alekhine Nouri (pictured) who had just turned 9-yrs-old last December 12, has won the Under 1900 (U1900) Blitz section of the 24th Annual North American Open that was held on December 29. 2014 at Bally’s Casino Resort, Las Vegas, Nevada, USA. Alekhine Nouri, with a current FIDE rating of 1617 and USCF rating of 1850, completed the blitz race with 9.0/10 points, 9-wins & 1-loss, to earn the $400 top prize. Brandon D Davis (1892), Jonathan Medrano (1789), Pratik Padhi (1714) shared the 2nd-4th place, a triple tie, with 8.0/10 points each, a full point behind the winner. They earned $100.00 apiece. FM Nouri also had won $818 by finishing tied for 3rd-9th places in the Standard U1900 section of the tournament on 26-29 Dec 2014. Nouri is currently in the Carlson Chess Club undergoing training and is being supported by Filipino community in Los Angeles. Alekhine Nouri’s father NM Hamed Nouri PHI(2420) also participated in the Open Blitz section and got 11th place scoring 6.5/10 (+5-2=3). 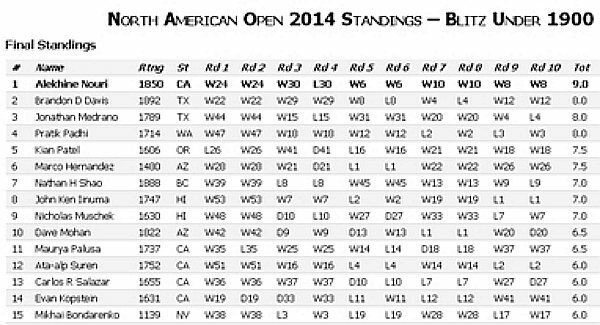 Read also: Wesley So wins 24th Annual North American Open. Click here to view a list of other articles written by Jose "joeyj" Jereos Jr..